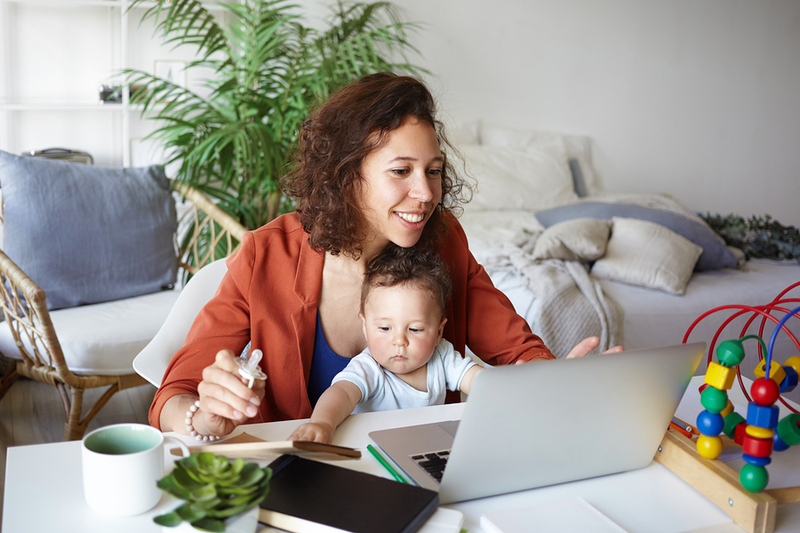 Most people think that working from home must mean you have more freedom to take care of your family and buckets of time to deal with all the to-dos that are usually crammed into weekends. While it’s true that your schedule is more flexible if you work from home, it’s also true that having so much free rein can reduce productivity, stretch out your work hours, and lead to increased stress, illness, and even burnout. The first few hours are critical to setting up your day for productivity. A regular routine that features a consistent wake-up time, a satisfying workout, and a good breakfast can go a long way towards setting the tone for a full day of productivity. For extra efficiency, add in an educational or inspirational podcast while you work out! There’s no need for a suit and tie at a home office. In fact, people aren’t suiting up in regular offices either! But taking a shower, grooming, and dressing as though you were going into a “real” office can help you jumpstart – and maintain – a more professional mindset for the rest of the day. Side bonus? You’ll always be ready for an unexpected video call, coffee meeting, or last-minute errand! Having a designated work area at home helps you stay organized and gives you space to spread out, organize your equipment and files, and even meet with clients. The separation between your work-space and your family space also gives everyone at home a visual reminder of where different activities take place, decreasing activity overlap and maintaining your work/life boundaries. Staying productive while working from home can be challenging! Let’s face it, the possible distractions are endless – who hasn’t had that sudden urge to clean the entire kitchen when there’s a deadline looming? Planning and protecting your work time with specific working hours, deadlines, and goals creates boundaries by limiting your time, which makes your work hours more productive. Without colleagues around to prompt a coffee break or social lunch, taking breaks throughout the day can seem selfish or frivolous. In reality, they could be exactly what you need to be more productive and happier overall. Non-negotiable hourly computer breaks, walks outside, and proper lunch breaks will actually increase your mental, emotional, and physical wellbeing and help you to focus better at work and at home. Tools like Slack, email, and Messenger are there to help you stay connected when you need to be – but for many of us they can become technological handcuffs to our work. Communicate to your team your general work hours, be responsible in letting clients know when you are – and aren’t – available, and make a pact with yourself to let go of the tools when it’s not work time. Since there’s no designated transitional or commute time when you work from home, it can be hard to turn off at the end of the day. Try creating your own leaving-the-office rituals to demarcate the change in your day from work to personal time. Write a list of to-dos for the next day (they’ll be there when you get back! ), turn off your work technology, physically close the door to your work-space, and structure intentional days off where you say no to work completely.